Few athletes have been covered as much or as nauseatingly as former Green Bay Packers quarterback Brett Favre. You’d think that would leave little left to be said about the man inducted into the Pro Football Hall of Fame last summer, but you’d be wrong. 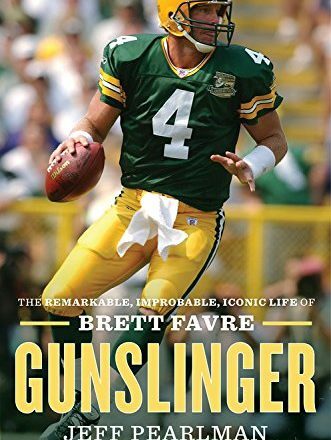 In his just-released biography, Gunslinger: The Remarkable, Improbable, Iconic Life of Brett Favre, Jeff Pearlman paints a full picture of the most complex figure in modern American sports. Pearlman, formerly of Sports Illustrated and the author of seven books, interviewed 573 people for Gunslinger, including Favre’s brother, sister, and mother, but not Favre or his wife Deanna, who he said politely declined. From page one, it’s clear that Pearlman is more interested in the man than the football player. While ink is spilled on the greatest moments of Favre’s career, including his first game replacing Don Majkowski, the Packers Super Bowl XXXI victory, and resurgent 2007 and 2009 campaigns, Pearlman spends much more time on the periods of Favre’s career previously given only superficial treatment. His tumultuous, lost first season in Atlanta gives a glimpse into the anonymous tragedy his story might have become, and the full extent of his partying and addiction to pain pills is laid bare. So is his extensive infidelity, and a relationship with his father more complicated than the hundreds of hillbilly anecdotes that came before would have you believe. I caught up with Pearlman to talk about Favre, the writing process, and why he was inspired to write about someone who has received more coverage than any football player alive. There’s a lot of negative material about Favre and the Packers in the book. What has been the reaction from Wisconsin media and fans? Nothing terrible actually. It’s gotten strong reviews. The Milwaukee Journal Sentinel gave it a really good review. I’ve gotten zero “how dare yous” with this one. The whole Rodgers/Favre thing [Rodgers has disputed calling Favre “Grandpa” at their first meeting] that caused some attention. But overall it hasn’t been bad. The reaction to the Walter Payton book was worse by a ton. I think the fact that Payton was not alive brought on a lot of “how dare you” responses. Also, Brett Favre never pretended to live a saintly life. If you told someone tomorrow that Brett Favre snorted cocaine – not that he did – but if you found out he did back when he was a young player, I don’t think people would be surprised. You’ve said that one of your criteria for a book subject is that you ask yourself if you can stomach spending two years with this person in your life. Now, Favre’s story has been covered for 25 years, with the media obsessed over his retirement, un-retirement. So many are nauseated by the mention of Favre, how come that didn’t turn you off? Because everyone kept talking about the same stuff. If I had to write about him retiring and un-retiring I think I’d slit my wrists. But once you get into the nitty gritty of the guy, it’s just really interesting. Going down to Mississippi, seeing his development, when you’re reporting this it’s almost like you’re going through his stages, and recreating it. It’s fascinating to me. Favre has just had this really interesting roller coaster of existence. A kid growing up in the bayou, not getting recruited, slipping in the draft. And his year with the Falcons, that I really loved writing about. I guess I’m a sucker for that stuff. But the main thing was, I really love Mississippi and writing about guys from Mississippi. It doesn’t hurt that he truly is an iconic sports figure. I was having this debate the other day about “Why isn’t Ken Griffey Jr. a great sports bio?” And I don’t know why, I can’t put my finger on it, I just have a feeling it wouldn’t be. That’s the difference between all-time great and iconic. There’s just something about him. Personality, performance, the way he played, longevity, where he’s from, his family background. Who didn’t talk that you really wished had? I would have liked Chmura, Frank Winters. I would have loved to have talked to Deanna, his wife. I didn’t get to talk to Mike Holmgren, but I don’t worry so much about guys who’ve been interviewed a million times about a subject. But you had a lot in there from Darius Holland [a backup defensive end for the Packers from 1995-1997] of all people. How come? Did I? Holland struck me as a very smart guy. If people give you good material, you use it. Sterling Sharpe talked a lot, and I didn’t think he would talk to me. Ryan Grant was terrific, really good. You want people who get it, who were in the locker room when some of these things were going on. They don’t need to be his best friend, and a lot of times it’s better if they aren’t. A lot of Wisconsin reporters have been covering Favre for 25 years, and have tiptoed around a lot of this stuff, treating Favre with kid gloves. How did Packers writers respond to you writing this book? Packers writers rightly feel territorial about Brett Favre, and then someone from the outside comes in and researches it and writes it. So you can understand a little bit of a “who the [expletive] does this guy think he is” reaction. I’m from New York and in New York, you go after everything and you go after it hard. In Green Bay it’s just different. The team is publicly owned. The town revolves around the Packers. New York doesn’t revolve around the Jets. If a guy is out partying in Green Bay and falling down drunk, if it doesn’t impact how he plays, nobody cares. You have to have a different approach if you’re covering the team in a small town like that. You write a lot about Favre’s infidelity, his partying, his flaws. Now you’ve talked to his family, and you’ve said you fell in love with his family down in Mississippi, so how do you approach writing a story like this knowing his daughters, his mother, his wife, and his family are all going to be reading this and what you write is going to impact relationships? I don’t enjoy it. It’s my least favorite part. It’s a conflict every time. I hate it, hate it, hate it. When a book is coming out, I get really uncomfortable. These are human beings. This stuff impacts people. I truly hate it. But I don’t know any other way to do it. I’m honest, I’m up front with people and try to be fair and tell them what it means to write a definitive biography. Brett Favre didn’t talk to you, but his family did. How did that happen? I don’t think he was happy that they talked. I don’t think that gave him great joy. He did give permission to a woman whose son died from cancer, for her to talk to me. But I’ve never had a situation like that before, where the main guy didn’t talk but his whole family did talk. How has the Favre family reacted? The only one I know who has read it totally is Dylan [Favre’s nephew]. He tweeted out and raved about it. I haven’t heard from any others yet. It seems superfluous to mention his arm strength as much as you do. A lot of guys have strong arms, were his really that different? He’s the first one I’ve heard of where guys say it whistled in the air. At first you think, well, sure it did. And then people keep telling you the same thing. People in college, the pros, people who’ve been around a lot of strong arms. That really stuck out to me. How much material is on the cutting room floor? So much. There’s more on the cutting room floor than I’ve ever had before after a book. What’s success for this book? You want it to sell well. You hope it has a shot to make the bestseller list. But also, these things beat the crap out of you. I’m physically and mentally exhausted. It’s the best job in the world, but it’s physically and mentally draining, and when it’s done you never want to see this thing again. So in a way, success is getting through it and moving on. And you hope it sells so you can live to write another one.